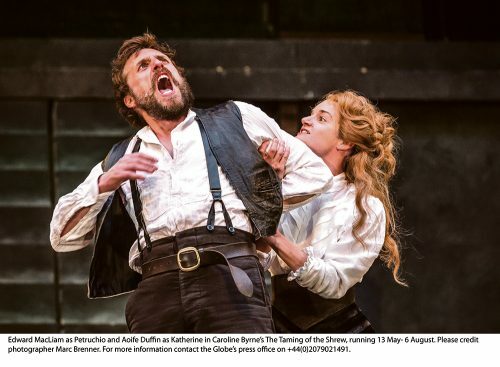 At The Globe this summer, an Irish production company is performing Taming of the Shrew, one of Shakespeare’s most studied dark comedies. 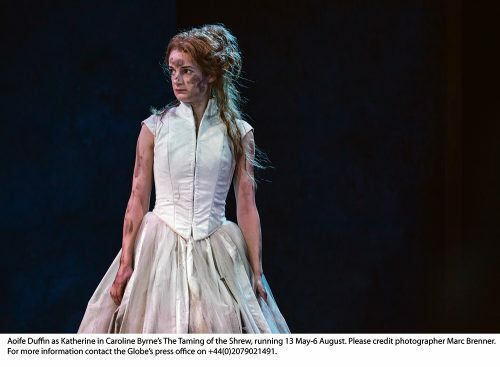 Director Caroline Byrne’s production transports The Taming of the Shrew to the 1916 Easter Rising and the design and costumes of this production reflect the setting. 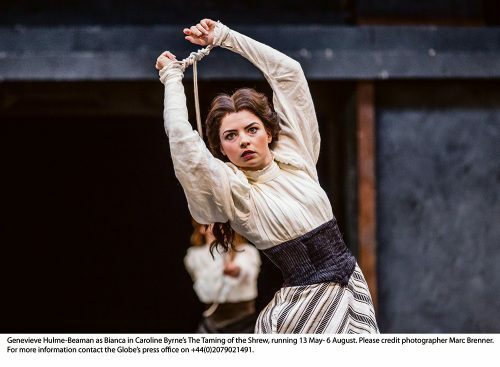 In the centenary year since 1916, more focus has been put on women’s role in forming the Ireland we know today, so Byrne’s interpretation has a thoroughly feminist feel. Edward MacLiam, known best for his time working on BBC hospital drama Holby City, plays the main male lead Petruchio. 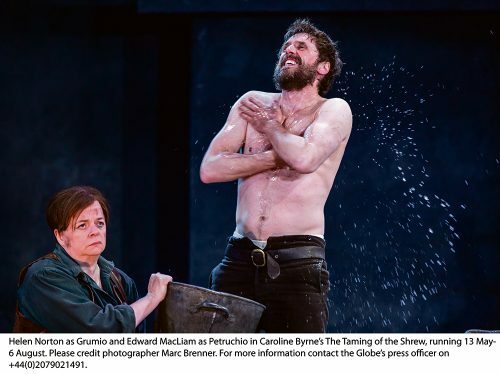 Petruchio is known for his domineering behaviour over his love interest Katherine, but MacLiam found a new meaning behind his character when he worked through the script with Byrne. “I had never seen a production of the play, and had never even read it until I joined the cast, so perhaps I was a blank page for Caroline. I’d only really heard people say that it’s one of Shakespeare’s biggest problem plays,” he says. “But it has been an interesting process. We interrogated the text in as much depth as we could. We looked into why someone would behave like he does. It’s a play written hundreds of years ago, you could sit down and say he is a blatant misogynist but I think there are themes within it that people may find surprising. And how blatant are the references to 1916, seeing as the Rising is not really something that can be alluded to in the original text? 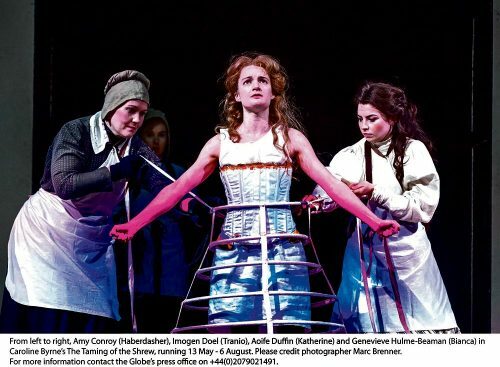 “The actual events are not brought into the text in a prescriptive sense, but I think Caroline has metaphorically taken the context of that time. The Proclamation describes Ireland as a female, and that was within a patriarchal society, so she examines how we have moved on and to what extent. “In the early days of the Irish free state, women’s involvement in 1916 wasn’t fully recognised as it took longer for them to get the vote and everything. The role of Katherine is being played by Aoife Duffin, after Kathy Rose O’Brien had to step down. Edward moved to London in 1998, and has only ever worked here so how is it to be working with an Irish production now? “Credit to the director who has built a terrific ensemble, everybody trusts in each other very much and enjoy each other’s company. So we go out there and have fun. We play, enjoy every moment, and perform it as sweetly and succinctly as you can. “I was very excited to join as I’ve spent my whole career over here so its my first time getting to work with an Irish company. And how is it to work on a Shakespeare play, and in the great venue of the Globe? “What I love with Shakespeare is there is a certain liberty you can take. You can really test how elastic the language is. How far can you stretch it and what does it conjure up in your own imagination. There are so many different avenues you can go down and I think we arrived at something which is very interesting. “It was a little nerve-wracking. This is my first time back at The Globe since 2008. The Globe is a fascinating place to work. I think Emma Rice puts it best; the most emotionally accessible theatre space in London. “It’s quite a daunting place initially to play. Especially after working on screen, the actor really is put at the centre of the work. “You have to exercise all your skills and open your kit bag and give everything you have. But it’s fantastic once you get used to that, and the audience are so responsive. And you have the groundlings and different tiers, so you have people functioning on different levels. They are engaging in the play on different levels, which is quite a challenge and it means you get such a diverse reaction from people too. Read our review of the play.